Boston’s marathon is the modern world’s oldest. It’s the best known. It’s an annual tradition. It’s been held since 1897. It’s one of six World Marathon Majors. Thousands of runners participate. Professionals and amateurs compete. Hundreds of thousands of spectators watch it. They do so throughout its 26.2 mile route. In 1996, a 62-year old Swedish participant died of a heart attack. In 2002, a young woman runner succumbed to hyponatremia. On Monday, April 15, two explosions killed three. Over 100 others were injured. Some lost limbs. The incident occurred near the event’s finish line. It’s in the heart of downtown Boston’s Copley Square. New York Mayor Michael Bloomberg tightened security. He said 1,000 NYPD employees have counterterrorism assignments. Boston, Philadelphia, Los Angeles and other major US cities initiated similar measures. They remain on high alert. Boston’s Copley Square was evacuated. Public transportation was disrupted. Logan International Airport suspended flights for several hours. A fire and possible explosion occurred at the John F. Kennedy Presidential Library and Museum. No injuries were reported. Police Commissioner Edward Davis said a preliminary investigation indicated a mechanical fire. Minor damage was reported. A bomb squad was deployed as a precautionary measure. The fire broke out around the same time as the marathon blasts. Both incidents appear unrelated. Other print and broadcast reports echoed similar sentiments. Conclusions are quickly reached. Feature stories headline “terrorism.” They’ll continue for days. Media scoundrels decide straightaway. It’s standard practice. Doing so heightens fear. Reports suggested the FBI declared the bombings a terrorist act. At issue was it homegrown, imported, or state-sponsored? 9/11’s the big lie of our time. So-called “crazed Arabs” had nothing to do with it. In numerous books, articles and lectures, David Ray Griffin provided convincing evidence. He separated myth from reality. So did others. The official story doesn’t wash. It’s the biggest lie of our time. Post-9/11, “war on terror” lawlessness followed. Bush and Obama wage it on humanity. It goes on abroad and at home. Multiple aggressive direct and proxy wars continue. Executive Orders, signing statements, as well as National and Homeland Security Presidential Directives established unconstitutional policies. Continuity of Government (COG) instituted coup d’etat authority. So did unitary executive and presidential diktat empowerment. Other extrajudicial measures advance them. Repressive laws were enacted. The Patriot Act alone established unchecked presidential power. Rule of law principles were subverted. Constitutional freedoms were undermined. Numerous other enacted measures made America a police state. Full-blown tyranny’s a hair’s breath away. False flags facilitate what follows. They heighten fear. They invent threats. They’re pretexts for militarism, global wars, occupations, police state repression, and other types of national security state extremism. “Supreme emergencies” are declared. Repressive laws are enacted. America’s global agenda is served. Unchallenged dominance is sought. Propaganda supports national interests. Media scoundrels regurgitate official lies. They do so ad nauseum. Fingers point the wrong way. Independent governments are targeted. Coup d’etats and extrajudicial assassinations are ordered. US citizens aren’t safe. Drones facilitate killing on the cheap. They do so with computer keyboard ease. Homeland dissent is challenged. Enemies are invented and targeted. Global wars become official policy. Homeland repression follows. It’s too early to know whether Boston’s incident was homegrown, imported or state-sponsored. What matters most is what’s next. Expect Washington to take full advantage. Doing so heads America toward full-blown tyranny. It’s already a hair’s breath away. 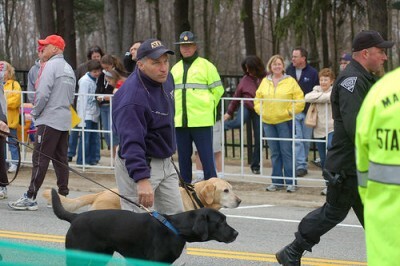 On April 16, Health Ranger editor Mike Adams said the official Boston Marathon story’s beginning to unravel. “It’s now becoming clear that members of the Boston bomb squad had advance notice of the horrific bombing” to follow. “This logically means they were all informed of (one) beforehand.” It doesn’t surprise. “The official story sounds” more like “cover” for what happened, said Adams. Obvious questions go unanswered. Who benefits most? Who stands to lose? Post-9/11 events best explain. Expect the worst ahead. Expect escalated Big Brother surveillance. Expect stepped-up police state repression. Expect more global wars. Expect greater than ever new world order harshness.